Early on in my career as an artist, I realized with a mix of delight and sadness that I had been walking past so much beauty every day without noticing it. As I began to look closely at familiar places, I saw surprising color, nuance, texture, and light in the most mundane scenes – shadows on the snow in an alley near my house, speckles of light splashed on the roof of my house from the tree leaves above… even traffic lights glowing on wet, grey February afternoons. As I began to paint nearby scenes, I shared them with the local community through various shows in coffee shops. 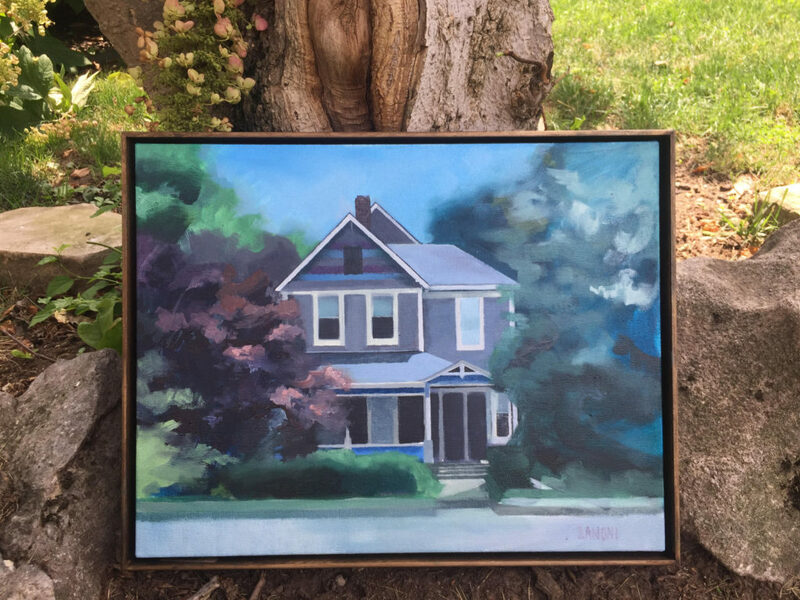 In addition to painting local landscapes, other frequent paintings I create are house commissions, like this one: (house commission photo) Even more than most historic neighborhoods in Indianapolis, Woodruff has houses bursting with life and nuance, and I love to reflect as much of those elements in a painting as possible. If you’re interested in commissioning a painting of your own house, you can write to me at aliciazanoniart@gmail.com.